If your culinary favorites are concoctions of mussels and “frites,” here is the brasserie to order “C’Heart Blanche.” Moreover, the olfactory and oral oases at this long silk-shaded, lit Bar, can make your nostrils expand exponentially, and your lips purse profusely. There exists a mellifluous smell of a myriad draft beers, cask beers and poured from bottled beers. To your left as you enter, a “standard” brick faux-façade and a low mid-room iron Vermont fireplace ruminate as garnish. Every table is butcher block and without linen; chairs mahogany. The ceilings and many walls are black and industrial. There are brighter rooms to occupy, including one thinner rectangle behind the brick wall, but the barroom is made the most interesting with its parade of wonderful, unadorned Mount Airy-headed personalities. Goat Hollows’ well-seasoned chef, Adam Glickman, is an alumnus of the forces behind the kitchen at Monk’s Café, the center city haven for friendly comfort food. The carry-over of comfort classics and pleased patronage is unmistakable, and Chef Glickman has remained a prescient beacon for accompanying his accomplishments amidst novel, richly flavored brews. 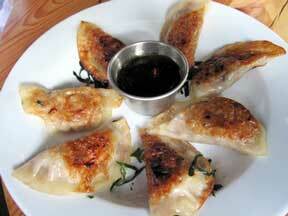 Split “Pickled Pork Belly Dumplings,” a starter ($9), to whet appetites. Pork, shallots, shitake mushrooms, pickled daikon and cabbage swirl forward as each dumpling is squeezed to fit a bite upon one’s tongue. The velvety brown-bubbled casings are as thin-skinned as a judge whose Opinion has been reversed, and featured in that day’s Legal Intelligencer. The pickling tickles, to hasten swallowing between gently grinding jaws. 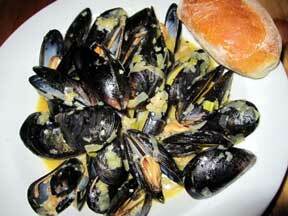 But save most of your energy for the “race for the mussels.” “Moules Et Frites” ($10/lb. 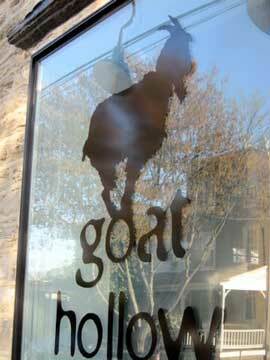 ): #1(“Goat Hollow”) are blatantly beer-bathed and battered by caramelized onions and house-cured tasso. The steaming bouncy succulents are viewed by a crowd of spec“tators,” thin, perfectly dried fries. They seem to be cheering you toward a favored mollusk. A well-padded roll straddles the edge of the bowl like an overseer. 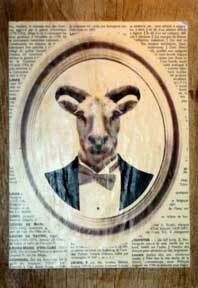 It sits solely to sop up the underlying broth as you progress with reigning in and devouring the sweating morsels. Throwing their pearly black shells into an auxiliary large bowl is an afterthought. The fare is sublimely fresh. Variations occur with other varieties on the same theme: #2(“Lincoln Drive”), adorned with leeks, immersed in white wine and frequented by chile de arbol; #3(“Sedgwick”), an herbal moules-mass in red wine, upon which scurry tomato bits; and #4(“Durham”), perfumed by basil, white wine and mozzarella. 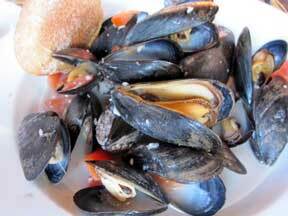 If you order all four, you may share and play as if the table were a “Lazy Susan.” Flex your mussels. Just remember to hold onto that puffy roll you rode in on. 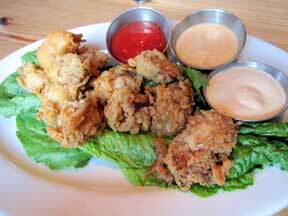 Kindly order the Goat’s Fried Oyster Sandwich (sans bread if you wish)($10). The marine bivalves arrive asleep, covered in golden breadcrumbs atop verdant lettuce. Three sauces share the bed, one of which is an unforgettable pink, ribald remoulade, into which you will be dousing even your fingers. The oysters are nestled so cozily that you hate to disturb them. But, you won’t regret having prodded them awake, dunked them in sauciness and pompously chewed them to oblivion. The warm spiced pieces, bedmate by bedmate, are swallowed with an unavoidable snort, in pillowed gulps. Have at elbow’s length a draft of Sly Fox O’Reilly’s Stout ($5.50), Pam Belgian Amber ($6), Old Dominion Cherry Blossom Lager ($6), Weyerbacher Heresy ($6); or Dock Street West of Center Pale Ale from a cask. I’m one who grew up with Schmidts, Ballantine, Blatz, Piels, Pabst Blue Ribbon and Miller High Life in quart bottles. They tasted, to me, like thirst-quenching liquids redolent of malts, alcohol and hopped-up ambrosia. The newest prideful brewing creates aftertastes of chocolate, coffee, cherries, oranges, pine, grapefruit, grass, birch, chamomile and/or wet hay. Bert and Harry are so far away. I order a Yeungling Lager ($4) to join me and the Smoked Brisket with greens and horseradish sauce ($11), magnificently crowned and drowned in just-melted provolone ($11). Ask for more remoulade as well. Fried spuds appear to be a Harpo Marx wig atop the highest edge of the platter, and a smiling quartered pickle at its bottom seems to get the joke. 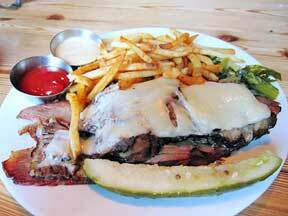 The brisket is pull-apart mauve at its smokey center and tenderly burly around its edges, emboldened by the promiscuously placed provolone. Dip a forkful in the remoulade, corralling the meat into its resting place between your lips, and allow your mind to wander aimlessly, without a worry. Then linger over lager. Chef Glickman’s tutelage pervades and prevails.